They're at your office, they're in your neighborhood and they're always getting in your way at the produce aisle. That's right, they're CrossFitters — that weightlifting, handstand-walking, Paleo-dieting community of individuals. This total-body-conditioning workout uses a wide variety of training methods, including weightlifting, gymnastics, rowing, running, calisthenics and much more. While it's a coed sport, men involved with CrossFit should focus on different movements, diet plans and rep schemes than their fairer counterparts. The goal for most guys doing CrossFit is to gain lean muscle and body mass. "To gain muscle you will want to be at about a 300- to 500-calorie surplus over TDEE (total daily energy expenditure)," says Forrest Jung, the owner of CrossFit South Bay in Hermosa Beach, California. If you want to lose fat, however, he recommends a 300- to 500-calorie deficit. In terms of your meal structure, Jung suggests a good macro ratio of 40 percent carbohydrates, 40 percent protein and 20 percent fat for muscle gain; 20 percent carbohydrates, 40 percent protein and 40 percent fat for weight loss. While we all love a good burrito, Jung recommends restricting cheat meals to only one every 10 days. When starting any workout routine, consistency is key — but so is rest. Workouts create micro tears in your muscles, and it's essential to take rest days in between CrossFit workouts to give your muscles a chance to fully repair themselves. Jung recommends three intense days followed by a light day and a rest day every six days. And make sure you get your sleep. "[People] both gaining and losing weight should also focus on getting eight to nine hours of sleep," Jung says. So once you're ready to hit that CrossFit box, what do you do when you get there? Try these 10 exercises, either as a complete workout or incorporated individually into your existing WOD (that's what CrossFitters call their "workout of the day"). Take your pull-up to the next level! With the added weight on your body, it's important to slowly lower down with control. This gymnastics exercise is an advanced move that requires a ton of stability and core and upper-body strength. A lot of guys focus on their arms and chest in their upper-body workouts, but then they completely skip their shoulders. But it's important to keep your shoulder strong to prevent injuries. The deadlift is an essential exercise for everyone to master because it's a movement pattern you use in everyday life. Squats are a favorite lower-body exercise for many people. Try this variation to build even more lower-body strength. Take a page from the strongest Olympic weightlifters and give this one a shot. For this exercise you can either start with a barbell in a landmine, secure one end of it in a corner or anchor it with another weight. This is another gymnastics-inspired move that will push your core strength to the limit. 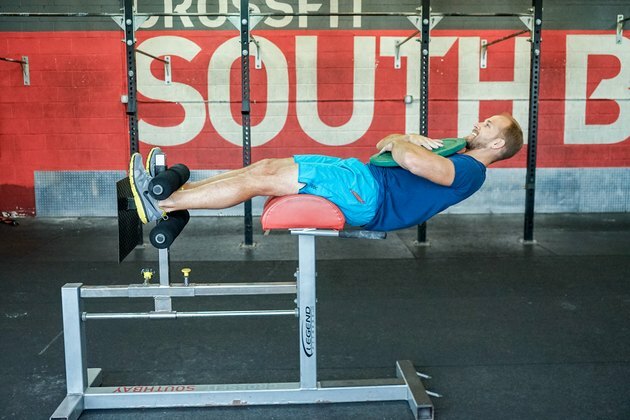 The goal of the GHD (glute-hamstring developer) sit-up is to build midline stability. Guys, have you ever done CrossFit? What did you think? What were your favorite exercises? What was your least favorite one? If you haven't tried CrossFit, exactly what is stopping you? Share your stories, suggestions and questions in the comments below!